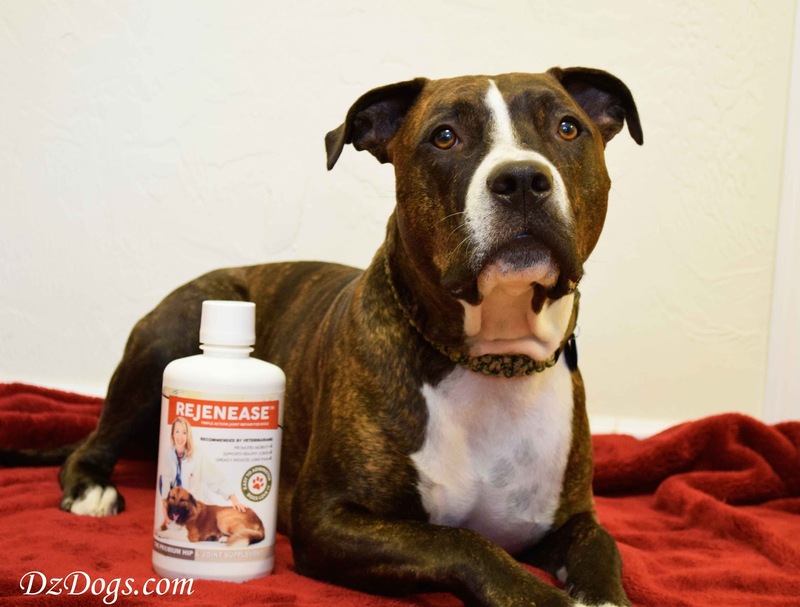 DZ's Adventures: Rejenease for Dogs - Giveaway!! 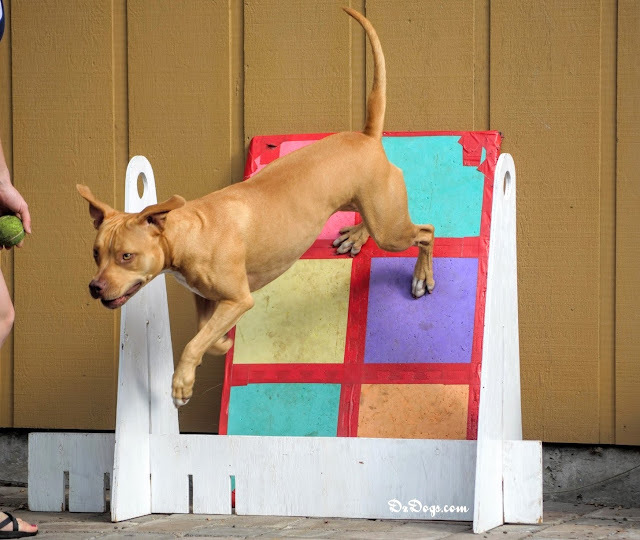 Flyball is so much fun! Being dedicated to the health of our dogs we take their nutrition and exercise needs very seriously and we are careful to read all the ingredients in their treats and food. When we first adopted Ziva the rescue was concerned that she might develop joint issues as an adult because she was limping frequently after playing with the other dogs. After bringing her home though we never saw any signs of a problem, but we wanted to be careful. 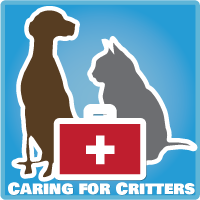 And after talking to our vet we decided that even though our dogs are young (and not currently showing any signs of joint issues) to do some home preventative care in the form of supplements such as healthy oils and glucosamine. A Fit Dog is a Happy Dog! Glucosamine is a natural compound found in the body that is used to keep the cartilage in joints healthy. Many humans use glucosamine to ease joint pain caused by osteoarthritis, TMJ, lower back pain, knee and elbow pain/injuries. It comes two main forms; Glucosamine Sulfate and Glucosamine Hydrochloride although these forms are similar, most studies have been done using the glucosamine sulfate form. Recent research done in 2010 has shown that glucosamine taken in tandem with omega-3 fats has proven to be more effective in reducing the pain and inflammation associated with osteoarthritis. 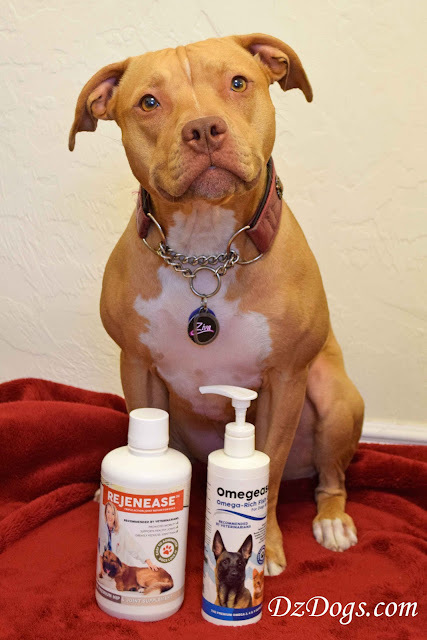 In exchange for a review they sent us their two products, Rejenease for dogs, and Omegease. One of the things that drew me to this company is that Finest For Dogs uses Human Grade ingredients that are tested for quality and purity in independently owned labs. They guarantee their product so if you don't notice a difference or if your dog doesn't like it then you get all your money back, and its made in the U.S! We tried Rejenease in tandem with their second product Omegease which is perfect since according to recent studies glucosamine seems to be more effective when take with omega-3 fats. Omega-3 fats especially EPA and DHA are primarily found in fish. These fats are awesome in that they have been proven to be a natural anti-inflammatory, they improve skin and coat conditions, thicken fur/reduce shedding, increase endurance and heart health, boosts the immune system, helps to lower blood pressure and triglyceride levels with can lead to heart disease, and they are used to treat arthritis by decreasing joint stiffness and pain. The anchovies, sardines, herring and mackeral in this oil are caught using environmentally friendly and dolphin friendly methods. That right there caught my eye! The oils are also cold pressed in order to not lose their health benefits and the oil has a very light almost non-existent scent. Big plus! One thing to note, we've tried fish oil in the past. However it gave Dante really bad gas....I mean send you outside and runaway... BAD GAS. Poor dog, so we took him off of it. But knowing what I know now, it wasn't very high quality stuff. Dante has been on the Omegease for a month now and he hasn't had any gassy issues. Hooray!! And both Dante and Ziva love it! Another thing that I love about this company is that it is a small company. If you have any questions at all about either of these products, the owner is named Steven and he previously worked as a pharmacist before venturing into the pet supplement industry. He's extremely helpful about answering questions! Dog To Walk, Run and Play Like They Used To. Details should be arriving in your inbox! Since the 70's we've used injectable Hyaluranic Acid when our dogs first show signs of lameness. It is a miracle for most dogs. Now that they use it on humans it has gotten almost prohibitively expensive. Originally it was injected directly into the joint on horses and later humans. It works just as well injected subcutaneously, although the last time hubby had his knee injected it was into the joint. Poor babies! Good luck! This product would certainly help! 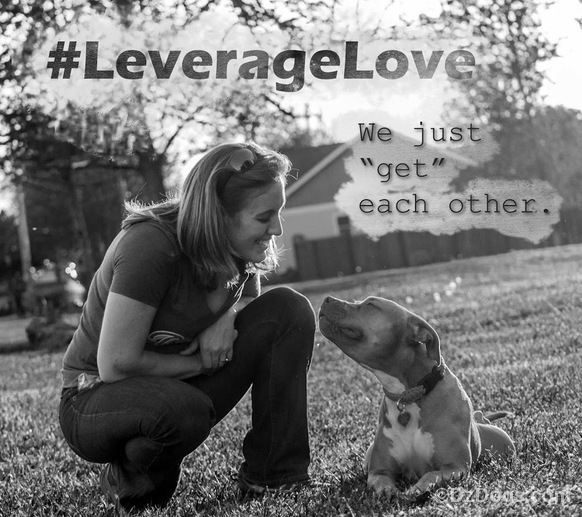 Your dogs are so lucky to have you caring for them after their suffering in the past. Good luck with the giveaway. Rejenease has been a miracle for my senior sister Katie. We all take it now, and Omegease too. Awesome products! We use Rejenease too - hope we win the bottle because we're almost out! Good luck from us too. Sounds like great products that we need to use! We love them! Good luck!! The omegease sounds interesting. I'd like to add it to the glucosamine that Koira already takes, as we are really happy already with our glucosamine supplement. They will work well together. Mr. N is on a joint supplement now as a preventative. 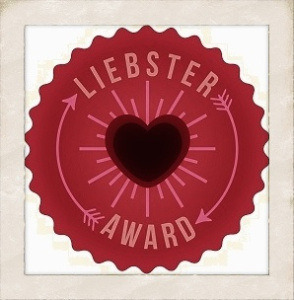 I've read & heard about this product before (I believe it was on My GBGVLife's blog) and made a written note about it. Right now, both of our pups are still young & don't have any joint issues, but this might change as they grow older. I'd like to win the Omegease since we have both cats and a dog. We have 5 cats and recently got a Husky. Thanks for the opportunity! I have Sampson on both of these products and I LOVE them. Still, I wouldn't mind winning another bottle of Rejenease. :-) Glad you like the products, they are a very good quality product. It's always nice to win! Good luck. Did you announce the winners for this yet?